A fabulous capture, well worth your dangerous drive back to your hotel later, excellent Photography. This is the most beautiful picture! Idk what I could say about this photo that hasn't been said..it inspires me to learn more. It's a photo you never forget. Masterpiece Multiplied! Wow thankyou for your lovely message! Fantastic colors, definition, and lighting! You must have been excited when you first saw this through your viewfinder. One of the most focused, detailed, colorful, balanced landscapes I've ever seen. ked the right combination of lighting and angle. Congrats! Merecio la pena. It was woth it!! Beautiful capture! Voted Simple Landscapes. Good luck to you! Worth the effort...beautiful! Where was this taken? After being inspired by an image seen on Flickr, I decided to try and find a similar viewpoint on Gran Canaria to shoot these two magnificent rocks in the same image. 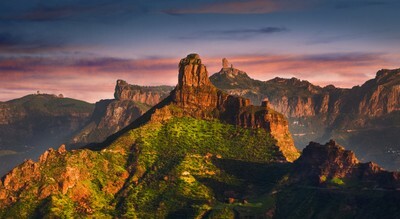 This photograph was taken near Tajada, in Gran Canaria, Canary Islands that has an amazing view of both Roque Bentayga & Roque Nublo; two famous geological landmarks on the island. It took a lot of scouting and homework to find the perfect spot before sunset rolled in. I was staying on the island to race in the Trans Grancanaria Marathon. What an amazing experience that was! I got to see so much of the island, it almost felt like a photography scouting adventure. This image was taken during sunset. My priority was to shoot Roque Bentayga & Roque Nublo in the same frame and I wanted to do this from a different perspective from what you may normally see. Other photographers have taken images of these rocks from the opposite side which means you can see the sun setting behind the rocks but at the cost of silhouetting the rocks formations. It was important to me to see the warm colours and tones on the rocks from the setting sunlight. The angle of the setting sun also gave the rocks more form and presence. Shot with a Canon EOS 5D Mark II and the Canon EF24-105mm f/4L IS USM Lens with a circular polarizing filter. And a Manfrotto tripod. I spent about an hour processing this image in Adobe Lightroom and Photoshop. On this particular day there was a lot of sand in the air blown in from the Sahara; what the locals call “Calima”. This produced a bit of a washed out original image but it also gave the landscape a greater sense of depth. So I knew that later, by playing with contrast and gamma I would be able to keep the depth of the atmosphere but also bring out a far richer range of tones over all. In photoshop I like to overlay various grades and patch them into certain areas of the image to draw focus and enhance interesting features. Landscape photography for me is a blend of what your camera can capture for you and your imagination. Some people can be afraid of image processing or maybe even anti it. If the final image is eye catching and makes you and others feel something special then its a successful image, no matter how you got to it. I recommend to anyone out there who hasn’t dabbled much in it to go and have a go because it really can compliment your photography, and really make the features you noticed at the time of the shot, shine. My Canon EOS 5D Mark II, Canon EF24-105mm f/4L Lens , Canon 17-40mm f/4L Lens, my trusty 50mm f/1.4 and a few filters including a circular polarizing filter. I also carry a spare battery and memory card just in case. For me, its all about the light. With that in mind my priority with pretty much any landscape shot is to make sure I am in the right place at the right time, in order to capture the most dramatic lighting possible. Of course, being in this situation can very easily occur with luck too, so you have to be ready to snap at a moments notice. This happened to be the case for the photograph in question. If you have any in-depth questions regarding the image processing side to photography and photoshop methods, please ask me in the comments and I will try to help your out with answers where possible.